The following blog is the first in a two-part finale ending a series of eight examining Current Trends in the Opto-micro-electronic and RF Packaging Eco-systems. Our aim has been to give our readers a glimpse of humanity’s shared technological future, as well as hints regarding Palomar’s own roadmap. This edition deals with the qualities necessary for deep and sustained engagement in the world of high-tech millennial commerce, the defining eco-system to our own. The views represented are entirely those of Dr. Anthony O’Sullivan Palomar Technologies Strategic Market Research Specialist. Dr. O’Sullivan will gladly field questions and comments. #8. Engaging Rapidly Changing Ultra-Tech Commerce: Part One. 1. Radically changing markets, technologies and geo-politics, demanding a timely, evolving, highly responsive business ethos. 2. The heart of this ethos lies in a dynamically perceptive and exceptionally attuned mindset. i. Is essential for productive engagement, connectivity and alignment. ii. Is necessary for anticipating changing technical and material demands. iii. Is the defining point of contact, inter-company and intra-corporately. To use a cartographic metaphor, it is the moment that degrees, minutes and seconds are set. This, of course, ensures a common arrival at the exact point of destination. 4. Collectively, this knowledge/communication/activity defines, refines and delivers exactly what customers need. 5. Each of these critical factors must contextualized by uncompromised high standards. 6. Finally, there is a critical holistic test that must be constantly applied—“A tree is known by its fruit.” This ancient proverb has the added value of capturing the millennial paradigm perfectly, put simply, “I hear what you do, not what you say”. Analysts agree that vendors must “up their game” and become increasingly agile if they are to retain relevance to this market. Furthermore, such attitudes and behaviors must be deliberate and constantly renewed within company thinking. Put another way, agility must be road-mapped in exactly the same way as any other, fundamental, corporate goal. Failing this, the result will be imperceptibly growing, then fatal, marginalization. The need for internal reinvigoration doesn’t just come from rapidly advancing technologies, but the even more from the quickening shifts in the scale and direction of the market. Much of the latter additionally being driven by government policies in Europe, the US and elsewhere. President Xi Jinping’s address to the October 2017 People’s Congress promised whatever resources are necessary for China to pursue advanced research, then produce the hyper-advanced technologies that will lead the world in mid-century. This finds particular focus on Artificial Intelligence (AI) and the soon to be, vast areas of associated products. As those who sell in this area already know, it is a strategy that has quickly become defining in many boardrooms across the Sino region. With the latter as merely indicative of the intensity—and breadth—of global shifts, it is now obvious that previous approaches to manufacturing efficiencies, service optimization, research and development, are no longer sufficient to meet even the most basic conditions for effectively competing in this sector. 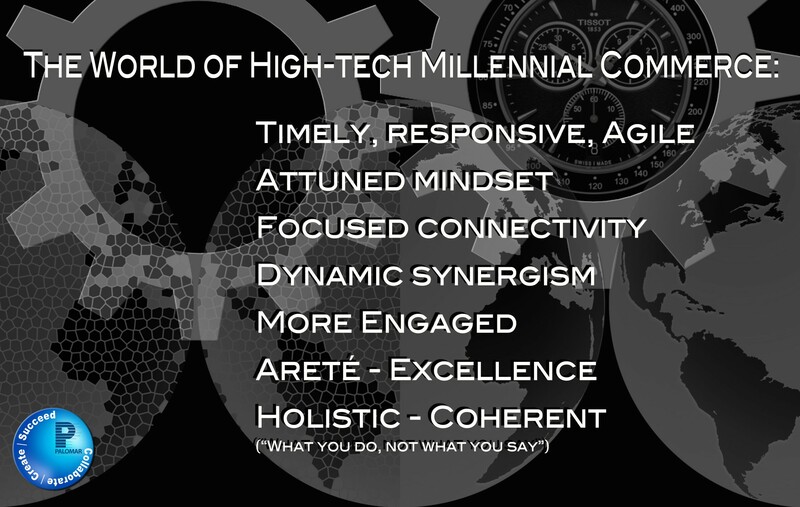 The world of 2020 not only demands organizational agility but anticipative responsiveness to the exhaustive range of dynamics that we call “millennial”. In other words, the classic concept of “business” is no longer sufficient. Market analysts are already concerned at the number of so-called high-tech success stories whose underlying mind-set and structures are proving frighteningly sclerotic. China’s centrally planned advance of millennials into leadership positions is their answer to this problem. “Millennial” while associated with a particular generation or age, must more properly be considered an attitude or consciousness based on a holistic approach. The latter, we must now emphasize, includes engagement followed by action. These latter elements move across a wide number of spheres (technical, process, political, economic, commercial, and so on). “Wide number” in the sense of “as many as are relevant” (in this manner those engaged can join the dots and create the necessary context) yet with a laser sharp focus in each case (which allows the engager to reach a sound conclusion and that vital point of sustained action). This “relevance” is centered in mental engagement, but includes the use of a new vocabulary that carefully corresponds to its narrative. This is the distinguishing element that makes it millennial, it is also the connection that guarantees renewed thinking translates into sustainable change. Emphatically, “renewed thinking” does not mean faddish or cliquish, but rather the increasingly careful adoption of ideas, and most especially, words. Words that demonstrate accurate correspondence to the evolution of technology, and, indeed, everything else. The millennials’ is not a fragmented world. For those who are beginning to wonder how practical all this is, let me now argue it is not so much practical, as absolutely critical. I am often asked “With so many articles in your field published, how do you read them all?” The answer is, “I don’t. I actually read very few. By applying the principles I have outlined, most prove a waste of time.” If the language is confused, if it fails to quickly display an argument, or is unclear, if the first paragraph does not convey the central point with absolute crystal clarity, the rest rarely holds little that is profitable. Valuable hours saved in wasted reading is not my point, however. Return on efficient motion, is. These principles are critical, both because they are valuable in themselves, and secure the six points with which we began this blog. Put another way, they yield the very essence of the millennium business culture necessary for high-tech engagement; people centric; fluid and learning; decluttered and decisive; holistic and purposeful; innovative and technology driven; inspired by common values engaged in co-creation. Given their now self-evident importance, I conclude on this theme in part two, before wrapping the series up in a short succinct summary.